The holidays are winding down and many of us have spent long hours in the kitchen preparing for large family gatherings. 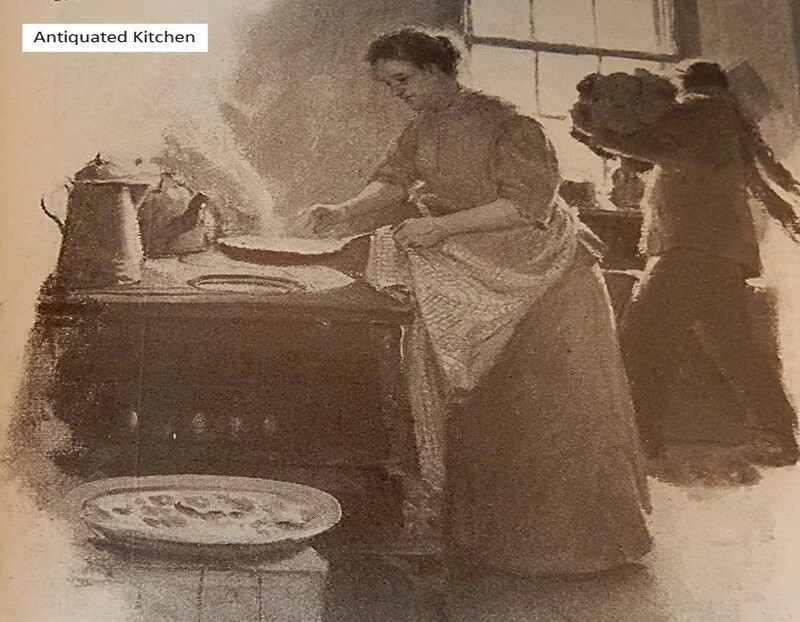 Perhaps now is a good time to consider what it was like to prepare meals in kitchens a hundred years ago. 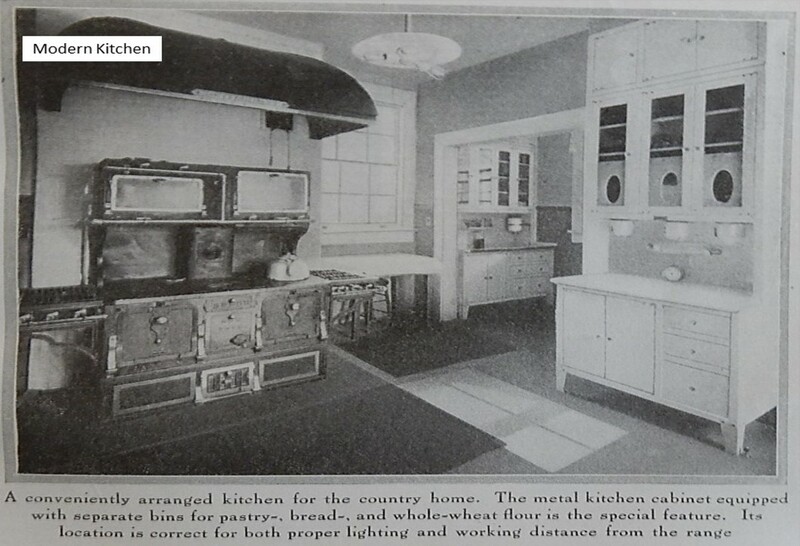 This April, 1915 article in Farm Journal implored farmers to consider how difficult it could be for their wives to cook in antiquated kitchens—and to make sure that modern conveniences were equitably distributed across the farm and the house. With families averaging 5.2 members in number, the housewife preparing three meals a day, provides in the course of a year 5,694 meals, a discouraging proposition under the best conditions, but cooked in the average kitchen, it becomes deadly monotonous. The lack of running water, a poor stove, the empty wood box, the heavy teakettle and iron pots, insufficient towels, antiquated woodenware, rusty and battered tin ware, the lack of a pantry, the cold in winter and heat in summer, the lack of screens, –I wonder how many meals the men folks would cook under these conditions. In these days, when efficiency is required along every line of work. I wonder how our women work against such heavy odds. If the men had to cook and keep the kitchen clean, they would want linoleum on the floor, they would have running water, the stove would not smoke and the wood box would never be empty. There would be good, handy and substantial tools to work with, the teakettle would be easy to lift and easy to clean, the knives would be sharp—oh, I am sure of that! There would be towels galore, and they would be good ones; a pantry would be built to save running to the cellar, the kitchen would be protected in winter and shaded in summer, doors and windows would be screened, there would be a stool to sit on while doing some kinds of work, and a low, comfortable chair for other work, and a few minutes’ rest, now and then. There would be some good way to prop the ironing-board (no makeshift here) and irons enough to allow time for thorough heating. As the work is almost entirely done by women, they get along with things as they are, renewing and replacing the old as they have the opportunity. The farmer and his wife (or daughter, or sister, whoever does the work) should constitute a partnership, and for every convenience secured for his part of the work, there should be one for hers. It need not always represent an outlay of money, but it will represent love, appreciation, the desire to protect and willingness to cooperate, which is the foundation for family happiness and prosperity. I’m all about the pantry. Our new house is the first one that’s ever had a big walk-in pantry right off the kitchen. It has become my best friend. All that cooking was a lot of hard work and skill. I don’t think women ever received the credit they deserved. I totally agree that historically women often did not receive credit for all the wonderful things they did. Hopefully it’s better now–though sometimes I’m not sure. My husband made a cooker for outside that we use to smoke our meat ,and also to slow cook with,which uses only wood. Once again there is a little modern gadget that lets me know the temperature of meat and inside of the oven, when the oven starts to drop a bit then out I go to add wood. Can’t imagine not having that little gadget when cooking! Also when the electric goes out for a few days due to bad weather,gives me enough taste of how those ladies did it all the time! The wood cooker with the temperature gadget sounds wonderful. I think that I remember a post you did awhile back on smoking meat. I’m in awe of how you make traditional foods using traditional methods. We are the only ones on the whole block that have not re-done their kitchens. They have sparklingly beautiful everything, but their big, beautiful refrigerators are full of take out and ours is full of yummy leftovers from an old kitchen. I jumped to my feet clapping at the point where we question if menfolk would cook under those conditions!!! My step-great-grandmother was still looking on that first stove in the early 1960s. It was the one that my great-grandmother used when she was raising her kids in the 10s and 20s. I guess she missed the memo on a new kitchen, but then I doubt she had many magazines to read either. I also have fond memories of several women I knew when I was a child who used old-fashioned wood stoves. In particular, I remember a neighbor who always made awesome steamed puddings. Every year she’d give us plum pudding. She used to say that it was easy to make because her stove was always hot, so it was no problem to make slow-cooking steamed puddings. Oh, that sounds so wonderful. Thinking of the positive instead of the negative of a past way of doing something! The ice box is missing! Where would we be without the refrigerator? Thanks for sharing. We women still do most of the cooking even though we are also out in the economic workplaces as well. Cooking without electricity would be quite difficult. We are lucky to have our modern kitchens. Cooking methods sure have changed over the past hundred hundred years. Honestly, it’s amazing to think how even my little apartment kitchen would seem luxurious to those woman. I have refrigeration, a freezer, a dishwasher, a stove and oven, a microwave, and even a few of those small appliances: coffee maker, juicer, slow cooker. And tucked into the middle of the article? Those irons that had to be heated on the stove. Thank goodness for electric irons, too! Oh my, how times have changed. Thank goodness we are so electronic now…. imagine not having running water! A very sensible article. A well-designed kitchen keeps everyone happy. In my not so well designed kitchen I made the Scotch potatoes yesterday. Utterly yummy. It’s wonderful to hear that you made Scotch potatoes in your well-designed kitchen. I always enjoy hearing when someone makes one of the recipes that I posted in this blog. This was really interesting! The article not only points out how hard it is to cook in an old farmhouse kitchen, it also says that if the man of the family had to do the cooking, updating the kitchen would be a much higher priority. (And I tend to agree with that.) I didn’t know magazines printed articles with feminist points of views 100 years ago! That’s why I love exploring old magazines and books: it gives us a glimpse into how people really thought in the past. Thanks for sharing! A great reminder of what drugery a womans life could be…loved the call for action, so unexpected, on women’s rights contained within. You have found us some real gems in your blog posts and look forward to following in 2016. It’s wonderful to hear that you enjoy this type of post. I have a lot of fun pulling them together. Happy New Year! that’s a marvelous article. it made me think if we actually cook more these days or less in our even more convenient kitchens … hmmmm … It would be interesting to see. hmmm. . . my hunch is that we cook much less now than in the past. Somehow it seems a little sad. Hear, hear! I agree with this article completely. Hate to see the big well kept barn and the neglected house. Well, hated to see it back in the old days as I have often heard it descibed. There is a troubling lack of equity. Back then, most women had little economic power, which sometimes led to an unfair distribution of resources. How true–People back then would have just thought that was how cooking was done, and would have had no clue that future technology would make it much easier. The “modern” kitchen in the picture looks wonderfully sunny and spacious. I’ll never feel sorry for myself and my older appliances again–I still have it so much better than my foremothers did! Sometimes I even feel like we have too many appliances now. There are lots of appliances in my kitchen–some I use regularly; others not so often. I love the pictures of the two kitchens and the description. I didn’t have huge gatherings, but still had to stand in the kitchen for hours…with all the modern conveniences and aids. I’m in awe of how people did it with no temperature controls. My sense is that they somehow just knew how “hot” the fire needed to be. I’d love to find an explanation of how to adjust the heat in those old wood stoves to cook various foods, but so far I’ve never seen anything when browsing through old magazines and books. Even the updated kitchen sounds like a nightmare to me! 🙂 Happy New Year! I wonder what people 50 or a hundred years in the future will say about our kitchens. 🙂 Happy New Year! I hope that you have a great year. The older I get, the steeper the learning curve for each new piece of technology seems to be. 🙂 Thank for reminding me of that old saying, “If Mama isn’t happy, nobody’s happy.” As the role of women has changed over the years, it is interesting to think about how women obtained (and used) power back in the day. Happy New Year! Hey Sheryl, if you havent already seen the recipe for scrapple look it up. It was mentioned in an old movie and so I googled it. Kind of difficult to make but interesting.